Shanta R. Dube joined the faculty in the Division of Epidemiology and Biostatistics as an Associate Professor after a 14 year career at the Centers for Disease Control and Prevention. 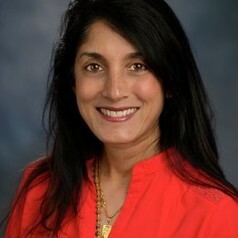 Shanta started her career at CDC in 1999, where she was awarded the Association for Teachers of Preventive Medicine Fellowship to be an investigator on a large-scale epidemiological study that assessed the impact of childhood traumatic stress on adult health outcomes. She is recognized both nationally and internationally for her research on the Adverse Childhood Experiences (ACE) Study, which focused on early life stress and substance use and abuse, and mental illness in adulthood. In 2007, Shanta joined the CDC’s Office on Smoking and Health to lead tobacco control surveillance and research in the Epidemiology Branch. During her tenure in the Office on Smoking and Health, Shanta was responsible for directing the implementation of 2 large national tobacco control surveillance systems and enhancing tobacco control surveillance through improved measurement and novel survey mode capability. In February 2013, she was lead for a CDC report documenting the high rates of smoking among adults with mental illness; it was the first report to demonstrate the burden of smoking at both the national and state level. Shanta also was involved in the first ever surveillance reports assessing the increased use of electronic cigarettes among U.S. youth and adult populations, which received national and international attention. Shanta’s main public health research focus is behavioral epidemiology, which studies patterns of behaviors that contribute to disease and well-being. Currently, Shanta’s research is focusing on the intersection between epidemiology and health promotion to examine the salutogenic model for wellbeing among adult survivors of childhood trauma and other disparate populations. She has published more than 50 peer-reviewed articles and reports, some of which were recognized and awarded by CDC for scientific excellence. She is currently Associate Editor for Child Abuse & Neglect.